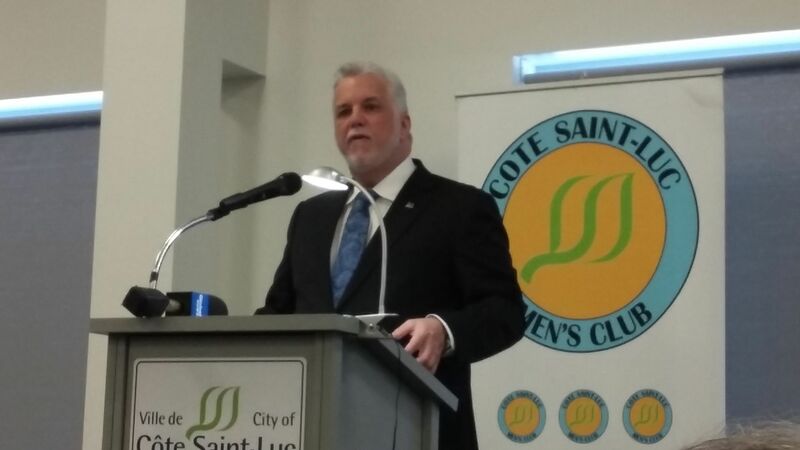 Quebec Premier Philippe Couillard spoke Friday to a full audience of the Côte St. Luc Men’s Club at that city’s Aquatic and Community Centre. The Premier spoke and answered questions about various issues, including health care, court case delays and seniors issues. He was also asked about the planned provincial riding changes for the next election, including the elimination of the Mont Royal riding as part of a merger with the Outremont riding, and the expansion of the D’Arcy McGee riding eastward. Local politicians and activists have argued these changes violate the Election Commission’s own guidelines that ridings’ “natural communities” should be respected. Local ethnic communities say they will be split between ridings. A citizens committee, chaired by Suburban editor-in-chief Beryl Wajsman and former NDG-Lachine MP Marlene Jennings, has hired constitutional lawyer Julius Grey to handle the legal case. Wajsman has been spearheading the fundraising effort for the legal case having raised over $6,000 in crowd funding. He took the opportunity to inform the Premier that the legal challenge will be filed in court before the end of the month. Couillard told the gathering that the riding issue is not restricted to Montreal, but also affects the Mauricie where two ridings are also set to merge. “People are not very happy there — it’s not related to language, it’s related to representation [in that area] on a very large territory,” the Premier said. Couillard explained that it was decided years ago to enable the independent, non-partisan Quebec Electoral Commission to decide on riding changes “to remove petty politics and partisanship from the issue. “The only way for us to act on [riding changes considered to be unjust] is to change the criteria on which the commission bases itself to make decisions, and for this we need to change electoral law. Couillard said he is concerned about representation by number. The Premier said he is also worried about the quality of representation, in relation to the rural ridings, because of their massive size distance-wise. Numerous dignitaries attended Friday’s speech. Couillard was introduced by D’Arcy McGee MNA David Birnbaum and thanked by Côte St. Luc mayor Mitchell Brownstein, and other attendees included Israeli Consul-General Ziv Nevo Kulman, Mount Royal MP Anthony Housefather and his chief of staff Bonnie Feigenbaum, Hampstead Mayor William Steinberg, and other MNAs — including Mont Royal’s Pierre Arcand — and Côte St. Luc council members, amongst many others. David Birnbaum, MNA for D’Arcy-McGee, argued before the Commission de l’Assemblée nationale today that proposed changes to Québec’s electoral map would compromise the democratic rights of three ‘natural communities’ within the riding – English-speaking, Jewish and senior citizens – by diluting their numbers within new riding borders. The wide-ranging proposal from the Commission de la représentation électorale would extend D’Arcy-McGee’s borders to include all of Snowdon district as well as roughly one-third of Côte-des-Neiges district. It would add 14,000 voters to the riding. The proportion of Jewish residents in those additional areas is only one-third of that in D’Arcy-McGee as it stands; the proportion of English-speaking residents only one-half. Birnbaum referred frequently to a legal opinion on the changes submitted to the Commission de l’Assemblée nationale by Université de Montréal Law professor Jean-François Gaudreault-DesBiens. That opinion suggests that many of the changes proposed could be unconstitutional in that they compromise the principle of effective representation and could have the effect of limiting the democratic representation of minority communities. Birnbaum also called for the reversal of the proposed merging of neighboring Mont-Royal and Outremont ridings, for similar reasons. Voter confidence: is the voter’s understanding of the electoral map, identification to the riding and access to the right to vote reinforced or strengthened by these changes? Is the equitable weight of each vote protected by the change? Have the caution and judgment prescribed by the Canadian and Québec Charters of Rights and Freedoms and the extensive jurisprudence been duly respected by these changes? Following a five-day debate in the National Assembly, a final version of the electoral map will be issued in February 2017 and implemented immediately. Birnbaum expressed cautious optimism that the modifications to D’Arcy-McGee and surrounding ridings would be reversed. He was one of 37 Liberal MNAs to appear before the Commission.